FERRARIO - [ The Morai. Hawaiian Islands ]. FERRARIO, G. - [ The Morai. Hawaiian Islands ]. [ The Morai. Hawaiian Islands ]. - FERRARIO, G.
Title : [ The Morai. Hawaiian Islands ].. Size : 8.3 x 10.4 inches. / 21.0 x 26.5 cm. 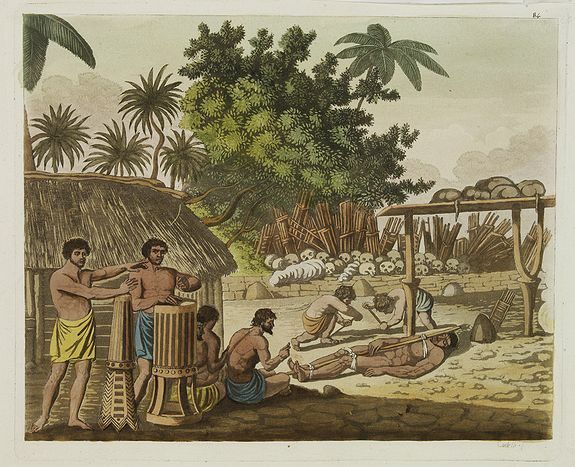 Description :Aquatint depicting the Morai (Tahiti), a burying ground and a place of worship where human sacrifices were performed. Engraved by Castelli. Plate N° 84. Condition : Upper margin cut short. Else very good condition.